On December 7 the world of Azeroth changes forever, but fans waiting for the Cataclysm expansion may want to hop back into World of Warcraft before the big day, when lead world designer Alex Afrasiabi says things will be insane. "We're literally waiting for that time when we flip the switch and BAM, the world is sundered," said Afrasiabi this weekend at BlizzCon when I asked him if the team was ready for the coming Cataclysm. Beta testing is still ongoing, but it's mainly polishing being done at this point. Earlier this month Blizzard released World of Warcraft patch 4.0.1, a preparatory patch for Cataclysm, introducing some major changes before the expansion, giving players time to acclimate. 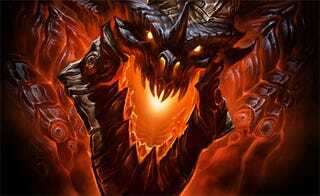 But the patch also set the world shaking in preparation for Deathwing's coming rampage. "Right now on live servers we have world events leading off. Initially there are rumblings, with the earth shaking and quaking, but it's light," Afrasiabi told us. "It steadily ramps up, and the craziness happens." What sort of craziness? "The cities start getting invaded by the elementals, and Twilight's Hammer comes out. The world's leaders get together, so you do actually participate in that." Blizzard has a tradition of seeding the world with special one-time-only events leading up to major patches and expansion packs. Cataclysm will be no different. It's expected that many lapsed players will return with the expansion to check out the changes made to Azeroth proper after remaining mostly the same for six years. Going by Alex Afrasiabi's comments, they'll probably want to come back on the final day before launch at the very latest. "Before we finally flip that switch on the last day, it'll be insane. Like, 'Oh my god, the world is coming to an end!'"